This is why, if you’ve been caught cheating, you make sure and pay off the scapegoat so he doesn’t talk. Because Barney Farrar and his attorney, Bruse Loyd, just blew up the whole thing. Like, poured gasoline on it, lighter fluid and all kinds of kindling, then took a freakin grenade to it… not just a match. 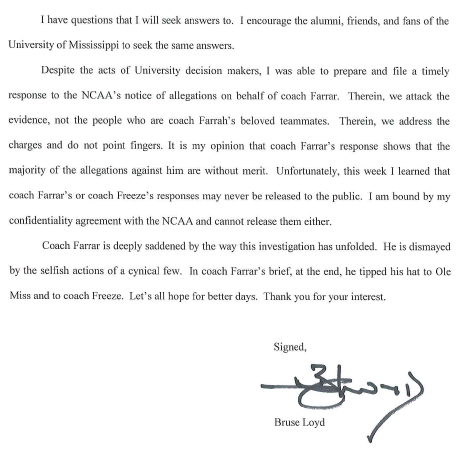 If you’re Ole Miss, or any of the boosters associated with this investigation, this is absolutely one of the last things you wanted to have happen. And it’s 100% why you discuss these things with Farrar before anything comes out. You can download the PDF file of the statement here, but I will have the images up for you to take a look at below. You’re just gonna have to read it yourself. Part 2: Hugh Freeze: Why is the NCAA going after him? 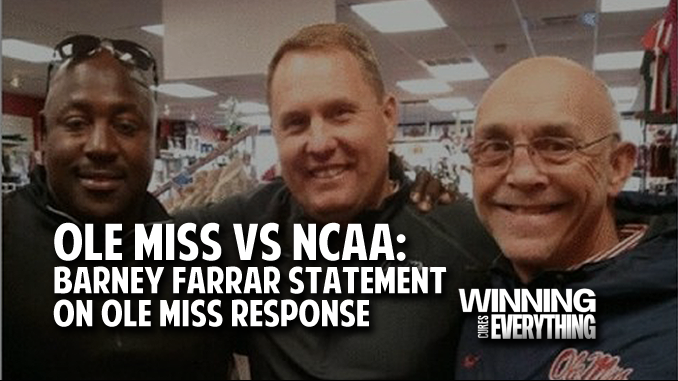 Part 3: Hugh Freeze: Why is Ole Miss standing with him against the NCAA? In the fall of 1999, there was a 5 star recruit that played at Trezevant High School in Memphis, TN named Albert Means. His head coach was Lynn Lang, and one of his assistants was a man named Milton Kirk. Now, I could go into all kinds of details on this, but you can just google “Albert Means” and get all of the court cases and whatnot. I’ll go with the condensed version, so you’ll see how it relates here. Albert Means signed with the University of Alabama out of high school. In a story broken in the Commercial Appeal by Gary Parrish, who is now a college basketball writer for CBSSports.com, it was alleged that Lang was given $30,000 upfront by Alabama boosters (along with other cash payments and gifts from other schools that Alabama outbid) and another $170,000 would be delivered to him once Means signed with the school. Kirk ratted out the entire operation to the press. Why? Because he didn’t get his cut. Lang and the boosters kept leaving him out of the deals. This is where Barney Farrar is. 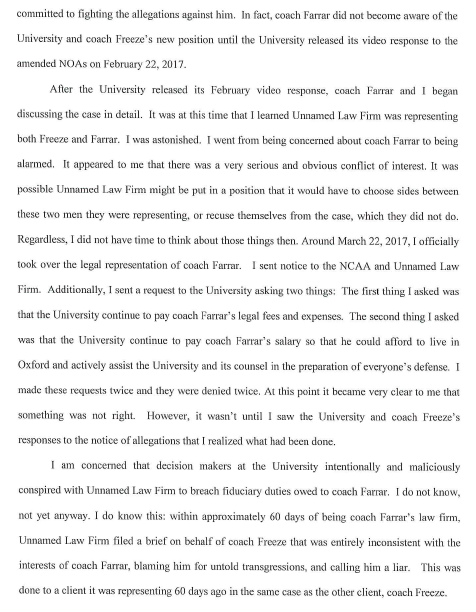 The school releases the infamous video laying out the NCAA’s NOA in Feb, where Farrar begins to realize what is actually going on. I don’t believe Farrar would have any problem taking the fall for a school that he’s worked at, twice now, for almost a decade. 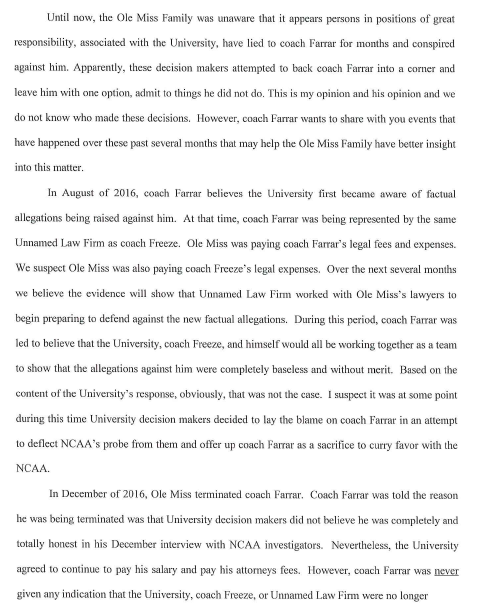 He truly believed, obviously, as evidenced by his attorney’s statements, that he was friends with his coworkers at Ole Miss (and still holds high regard for Coach Freeze), and now they’re completely singling him out as the lone rogue assistant that did things his way. He’s in his late 50s and would, probably, be fine with taking possibly the biggest payday he’s ever seen just to go away and never talk to anybody. Instead, they led him to believe they were all in this together, and then completely left him out to dry. And he’s not taking it lightly. Go read “Meat Market” and tell me if you believe Farrar is capable of devising a scheme this complicated and keeping it hidden from everyone else on his staff. He’s portrayed on Ed Orgeron’s staff as somewhat of a buffoon, if we’re not sugarcoating things. This is a bombshell. 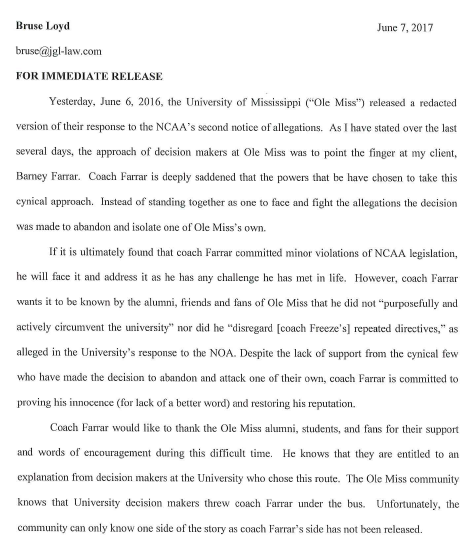 Farrar and his attorney just nuked the Ole Miss response to the NCAA. Bob Stoops is retiring… but why?